Do you know which activities, lessons or projects were successful this year and which weren’t? Do you know which ones should be improved upon for next school year? Most likely, you think you know the answers to the two questions above and I’d bet you’re on the right track, but if you ask your students you’ll get clearer answers. In fact, they’ll go a step further and offer specific suggestions or accolades within their feedback. You may find, as I do each year, that they liked a project far more than you realized or that a project that you perhaps thought was a great success was actually a bust in their eyes. Most likely, you’ll also learn new things about yourself. I find that my students, year to year, are incredibly perceptive. The End of Year Reflection form is my greatest tool for professional growth. Perhaps it can be yours too! Here are the prompts that I include on my form. With the exception of the last prompt, I check them all as “required questions” in Google Forms. Students complete the form anonymously on their computers. I used Google Forms to create mine and posted it to our KidBlog website to share it with them. I recommend allowing students to use a computer to submit this feedback, as they feel free to be more candid when they feel you cannot identify their handwriting. Making learning fun is what motivates students. The feedback you receive will help you keep learning fun for your students from year to year. Students feel valued when asked for their opinion, and if you ask nicely, they’ll go above and beyond to help you grow as an educator. 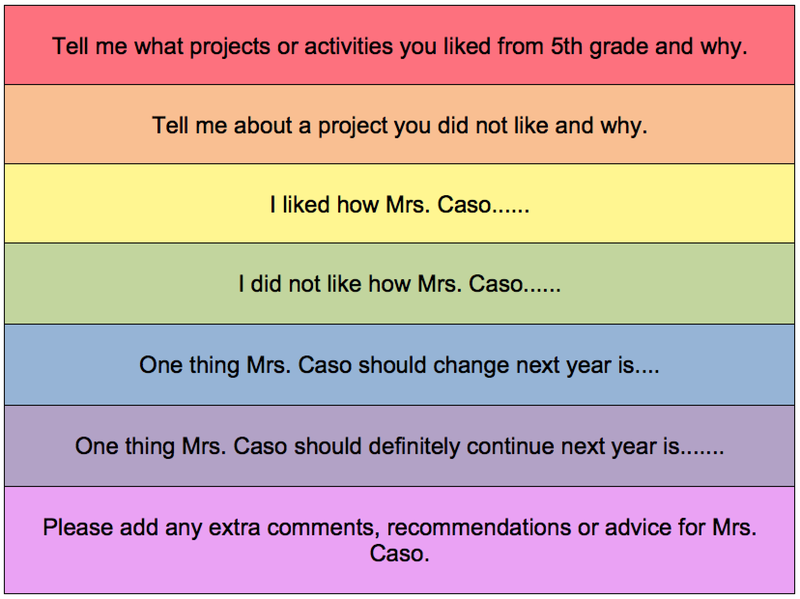 In the feedback given to me, I not only learn about which projects were favored or disliked, but I learn what students liked or disliked about me, my approach or my teaching methods. THIS is IT. This is gold for a teacher who is willing to hear it, reflect on it, and act on making improvements. Here’s a prime example of it’s success. Last year, to my surprise, I learned that my students were generally unhappy with a particular WebQuest that I created for Social Studies. I wouldn’t have known this without my student feedback form. To me, the final product looked great and it was a success because students demonstrated understanding of the material. Unbeknownst to me, it was too much work and the students felt overwhelmed. They gave me nice, detailed feedback about the project which allowed me to change it. I made changes over the summer and gave it another go this year. This year, the same project showed frequently as a project that students particularly enjoyed. Due to the feedback from my students last year, I was able to make learning more enjoyable for my class this year. That’s success. Think about it, each year we teachers get an evaluation from an administrator. In most cases, that person has witnessed less than a school day’s worth of your teaching over the course of the school year. Now, your students, well, they’re with you all the time. They know your classroom and your teaching better than any observer. They’re spending about 180 days with you, so doesn’t it make sense to ask them how you’re doing? As children, they’re incredibly honest, making the feedback even more valuable. I understand that this type of reflection may be difficult for some grade levels, but it works beautifully in my 5th grade classroom. If you’re an upper elementary school teacher, I suggest you give it a try. One tip: you’ll get the best feedback if students are familiar with reflections. In my class, we frequently complete reflections, so by the time they complete this one for me, they’re pros. Another tip: have a sincere chat with your kiddos ahead of time. Let them know that they are welcome to be honest, that you will not know who submits which form, and that their feedback will help you grow to become a better teacher.